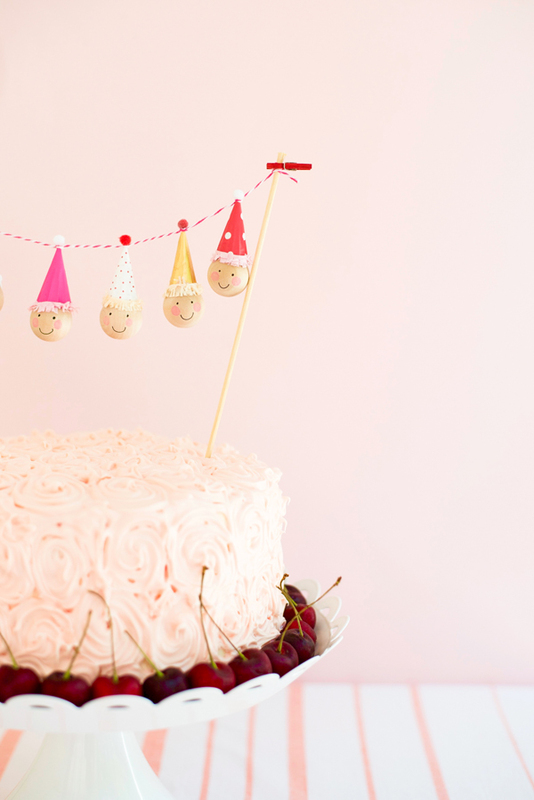 Cake toppers are like accessories for a cake. 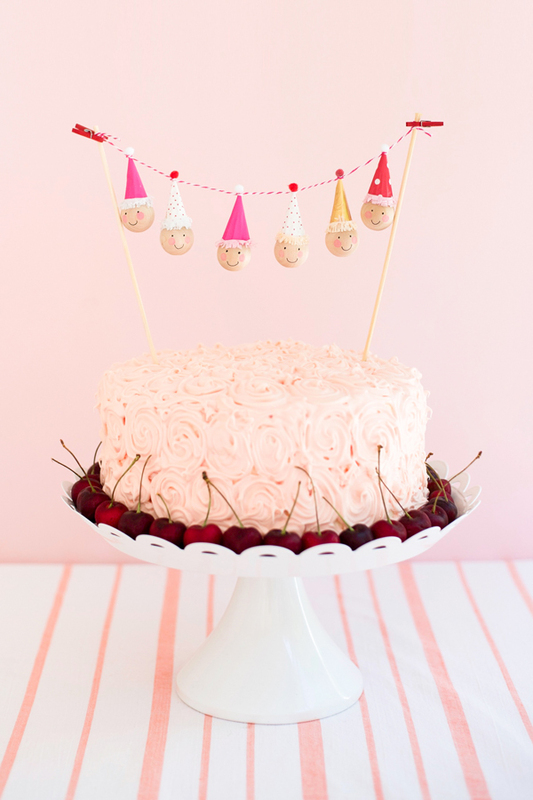 They can add charm, make a statement, and easily “dress up” a cake. 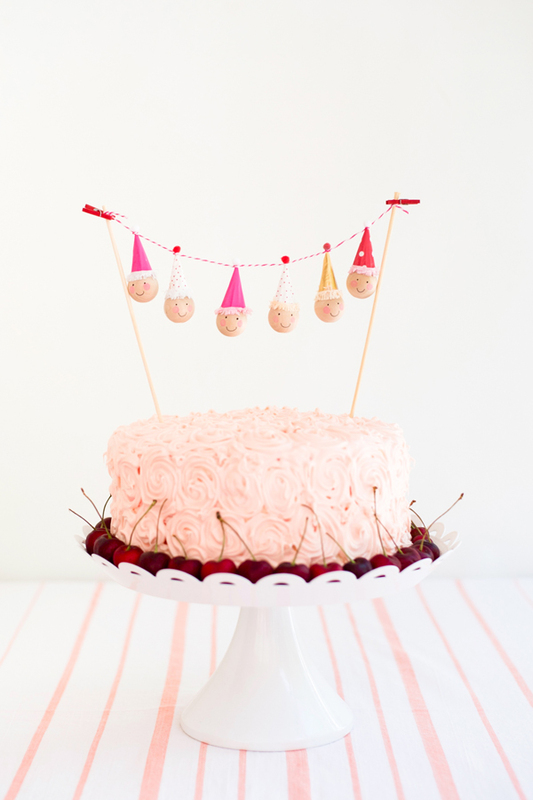 I love making these little bead headed guys – you can also see a similar version for cupcakes right here. 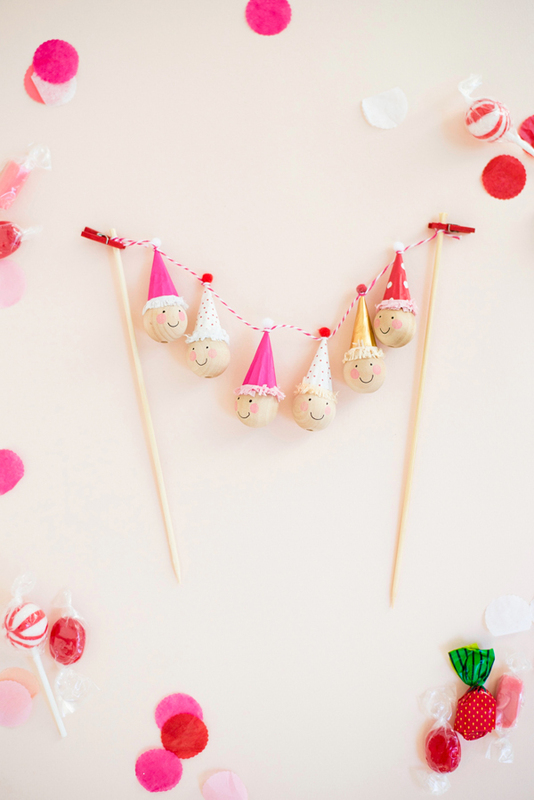 Materials needed: 1” unfinished wooden round beads (25mm), mini cupcake liners, mini pom poms, craft glue, string or twine, scissors, tissue paper, black pen, pink stamp ink, clean pencil eraser, 2 mini clothespins. 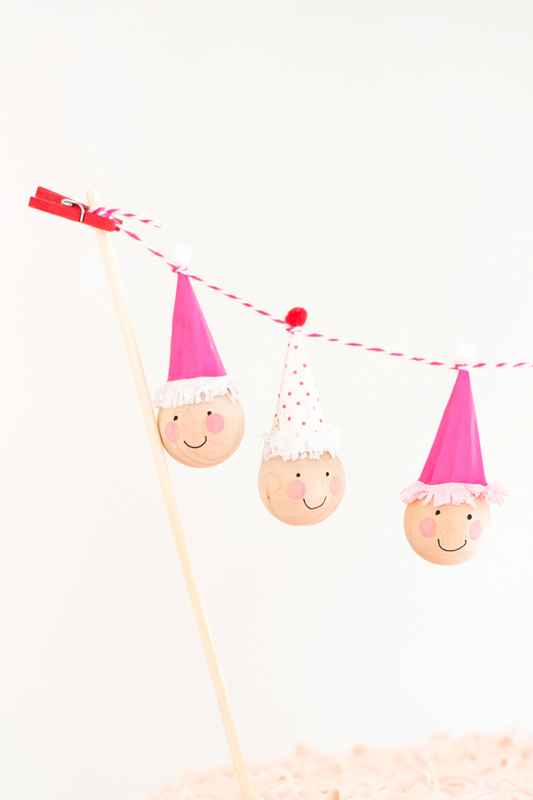 Step 1: On a round bead, draw two dots for eyes and a half circle for a smile. Step 2: Using the round eraser of a pencil, stamp two rosy cheeks with pink ink. 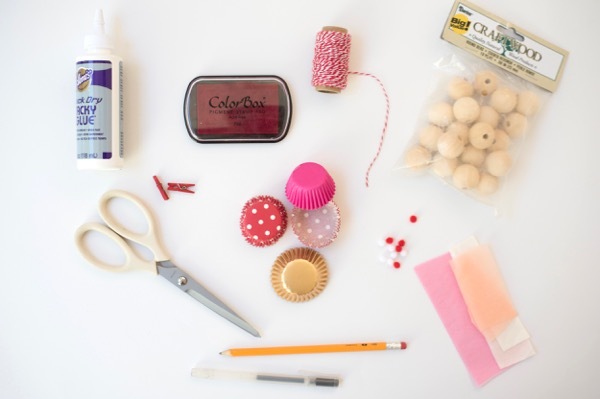 Step 3: Fold a mini cupcake liner in half, then gently twist the liner into a hat shape and secure it with glue. 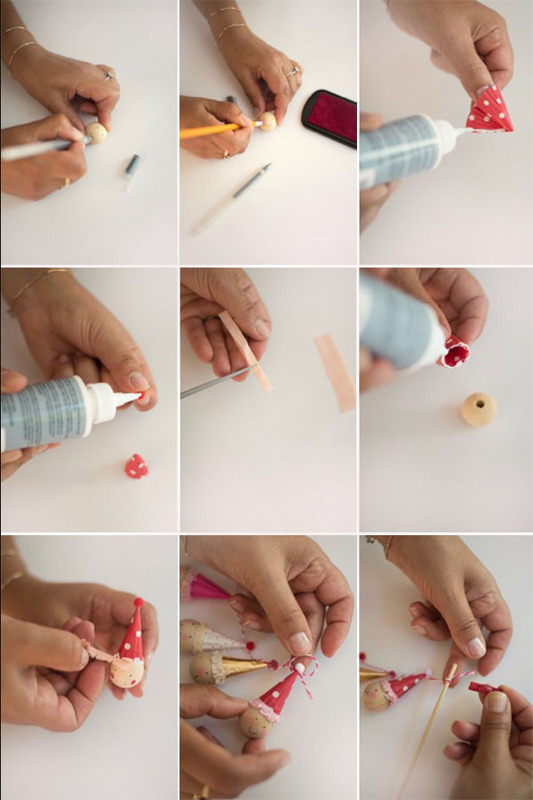 Step 4: With a tiny bit of glue, attach a mini pom pom to the tip of the hat. Step 5: Cut a 3 x ½” piece of tissue paper. Fold it in half lengthwise and cut fringe into the long side. Step 6: Apply a small line of glue around the base of the hat, and glue the hat to the top of the bead. Step 7: Wrap the fringe around the head. Let dry, and then gently fluff the fringe out with your fingertips. Step 8: Cut a 12” piece of twine. 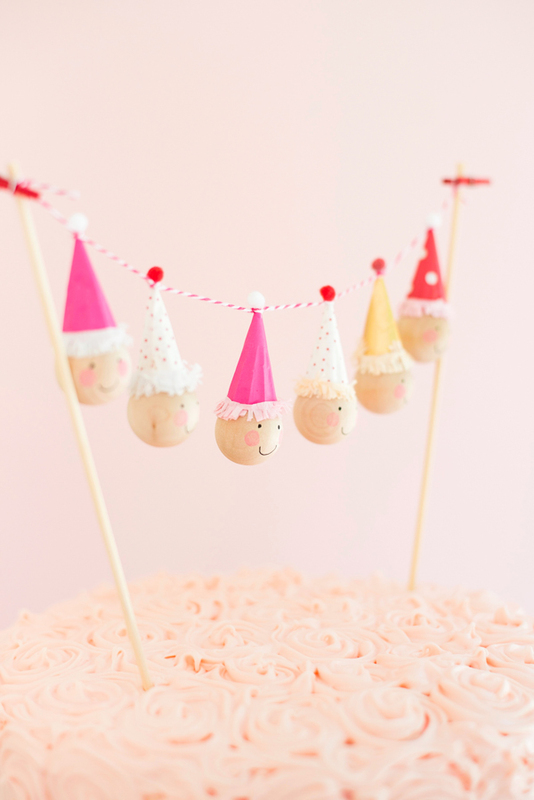 Once the mini pompoms are securely dry, tie a knot around each mini pom pom, spacing the heads about ¾” apart. Step 9: Tie each end of the twine to each skewer, about 10” apart. Clip the twine with the mini clothespins, and cut off any excess twine. You guys kill me with cuteness and creativity EVERY TIME!!!!!! This blog makes me so happy. Keep those delightful original creative ideas flowing. I love every post!!! !